In 20 minutes huge tidal waves swept through Dagai Village in Kadavu, washing away Tomasi Ratuyale’s house worth $30,000. The yaqona farmer had built his two bedroom wooden home last year where he stayed with his wife and two children. On the eve of Tropical Cyclone Keni last week, the 29-year-old watched helplessly as huge tidal waves invaded his village and at the same destroyed the home he had worked hard for over the past few years. “For three years I have been sav­ing money which I earned from selling yaqona and last year I built my home without depending on anyone, I was still celebrating this achievement and a dream had set when I started my family. “I had moved my two children and wife to the evacuation centre. I saw big tidal waves crashing into our village so I tried to go back home and save whatever I could but un­fortunately while trying to do that I was swept by the tides and ended clinging to a tree waiting for the wa­ters to recede,” Mr Ratuyale said. With his children still in primary school, he added it would be a strug­gle to build another home similar to what he had before. “As you know life is hard nowa­days and the cost of living is ris­ing, I wanted to save for my chil­dren’s education since they are still young. But right now I don’t know what to do,” Mr Ratuyale added. 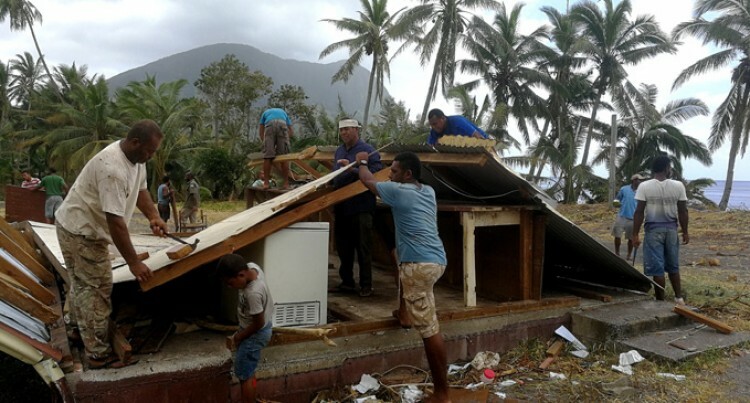 Another villager 68-year-old Ateca Ratukalou’s home was completely destroyed by the tidal waves. “I stood with tears after I returned to my village the next day, it was so heart breaking to see the house my husband had built about 36 years ago completely destroyed. Village headman, Anare Nawalu said the village comprises 273 peo­ple with 52 households in which 10 were partially and nine were com­pletely destroyed. “It was still daylight at around 12pm when we felt the first wind, it got dark and then later tidal waves swept through our village, but we were fortunate that no one died,” he added. Meanwhile, Ministry of Women, Children and Poverty Alleviation also distributed diapers and SMA milk to supplement infants as the village tries to recover from that traumatic experience.